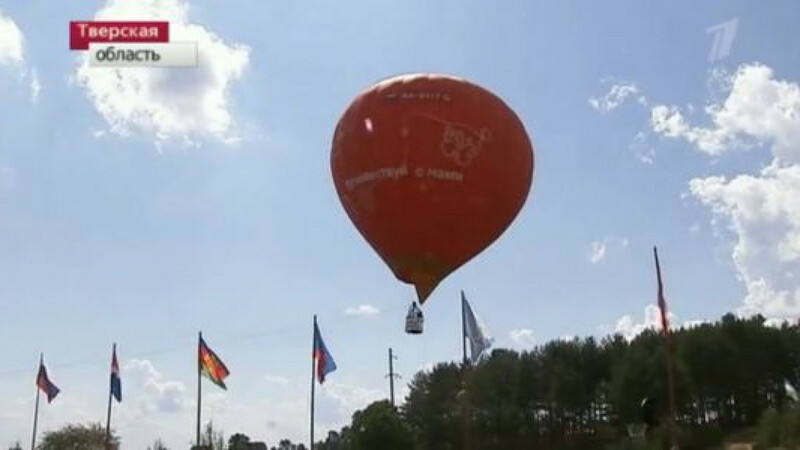 Channel One broadcast images of Churov's arrival in Seliger in a red balloon decorated with the words "Travel with us!" Central Elections Commission Chairman Vladimir Churov arrived at a pro-Kremlin youth camp by hot air balloon Friday, taking inspiration for his journey from a character in a Jules Verne novel. In the novel, Smith and four other characters hijack a hot air balloon to escape famine and destruction caused by the American Civil War. The official added that Churov would meet with forum participants and give a lecture as part of talks on politics and civil society at Seliger, a government-funded youth forum that takes place every year in the Tver region. Churov, who was accompanied on the balloon trip, had to attempt landing twice after ending up in a bog on the first attempt. The much-maligned elections chief, whose resignation opposition politicians sought in the wake of December parliamentary elections tainted by allegations of fraud, last attended Seliger four years ago. In 2010, the youth camp's reputation suffered a blow when members of radical pro-Kremlin group Stal organized an exhibit featuring portraits of Kremlin opponents and rights defenders mounted on stakes and wearing hats with swastikas.